Congratulations ! The original artwork is available for purchase for $138.60 shipping included. You will be able to review this purchase in the subsequent screens. If you have a question, please email support@pastelspace.com. Purchase 1082 x 1280 pixel digital file by using the Buy Now buttons below. You will receive an email with the download link. You can use the link 5 times to download the digital file. This acrylic painting was first started outside, Plein Air, as I was standing on the side of the almost dry creek bed. 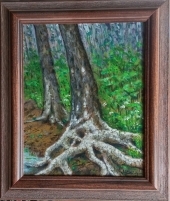 This old tree, with its uncovered white roots, set the stage for the colorful green underbrush set in the woods..
New artwork uploaded. This acrylic painting was first started outside, Plein Air, as I was standing on the side of the almost dry creek bed. This old tree, with its uncovered white roots, set the stage for the colorful green underbrush set in the woods. I have been an artist since elementry school. I studied Graphic Design in college where I took every art class available drawing, painting, pottery, printing, and more. 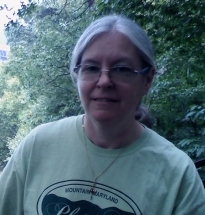 I am a member of the Western Maryland Watercolor Society, Allegany Area Art Allience, and the Allegany Arts Council. I am a painter of many different mediums; acrylic, watercolor, oils, and mixed media. My subjects include landscapes, animals, nudes. I accept commissions and can work from photos.